While HMD Global is seemingly busy in making the newly launched Nokia 2 (2018), Nokia 3 (2018), and Nokia 5 (2018) available across the worldwide markets, renders highlighting the Nokia 5.1 Plus have surfaced online. The renders showcase that the unannounced handset includes a notch design. In a separate news, the global variant of the Nokia X6 with model number TA-1103 has received Taiwan’s NCC certification. The Nokia X6 debuted in China last month with an iPhone X-like notch design and a dual rear camera setup. The smartphone was sold out in 10 seconds in the first sale that was held through JD.com, Suning.com, and Tmall.com. 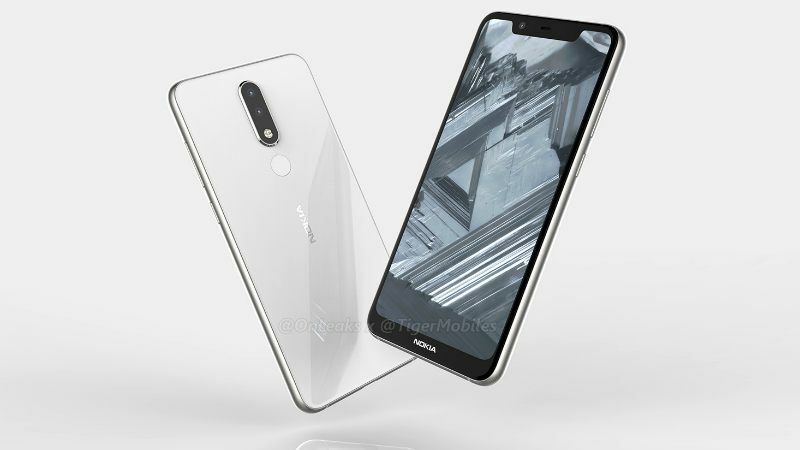 As per the leaked CAD renders, courtesy OnLeaks and Tiger Mobiles, the Nokia 5.1 Plus will come with a thin-bezel display and include the notch – featuring a front camera, earpiece, and some sensors. On the back, the renders show a dual rear camera setup along with an LED flash. The back panel appears in the renders also includes a fingerprint sensor. Further, there is apparently a USB Type-C port and a loudspeaker grill at the bottom, while the top of the smartphone seems to have a 3.5mm headphone jack and a secondary microphone for noise cancellation. Contrary to the details emerged through Nokia 5.1 Plus renders, the Nokia 5 (2018) aka Nokia 5.1 has a traditional 18:9 display and a single rear camera setup. The smartphone also doesn’t have a USB Type-C port and instead includes the dated Micro-USB. All this shows that the new Nokia handset will be a decent upgrade over the existing model. Apart from the Nokia 5.1 Plus renders, HMD Global is separately in the headlines for the global Nokia X6 variant. This new handset, carrying model number TA-1103, has received NCC certification in Taiwan. The listing on the NCC site, as spotted by DealInTech, doesn’t detail any specifications or features of the global variant. However, it is worth noting here that the same model received Bluetooth certificationlast month. HMD Global hasn’t announced any development towards the global Nokia X6 variant so far, though CPO Juho Sarvikas hosted a Twitter poll to evaluate the launch of the new Nokia X series model in global markets. Late last month, HMD Global hosted an event in Moscow to launch the Nokia 2 (2018), Nokia 3 (2018), and Nokia 5 (2018). The new handsets are the successors to the Nokia 2, Nokia 3, and Nokia 5 launched last year. The Nokia 3 (2018) and Nokia 5 (2018) come under Google’s Android One programme, whereas the Nokia 2 (2018) runs Android Oreo (Go edition).